Find tasty sandwiches and salads at the café inside the new Whole Foods Market. Grocery shopping ain’t what it used to be. From Lucky’s Market to Earth Fare, we’re seeing a micro-bubble of new grocery stores that offer full-on restaurant experiences, with everything from quick breakfasts to ramen, craft beer and steak frites. The new Whole Foods, controversial thanks to the developers’ choice to build on wetlands, offers the fullest expression of the trend, with the installation of Brasserie Honoré in the front left corner. The restaurant is set off a bit from the hustle and bustle of the shop floor, with a long bar underneath a pressed tin ceiling and a smattering of tables with swivel chairs and comfy avocado-colored sofas. Honoré offers solid happy hour discounts, with $2 off your beer or wine and even your pizza or your burger. The menu shifts throughout the day, with simple items in the morning (a baguette and butter for $2, toast with avocado and eggs for $5) and sandwiches, charcuterie plates and more substantial meals at lunch and dinner. 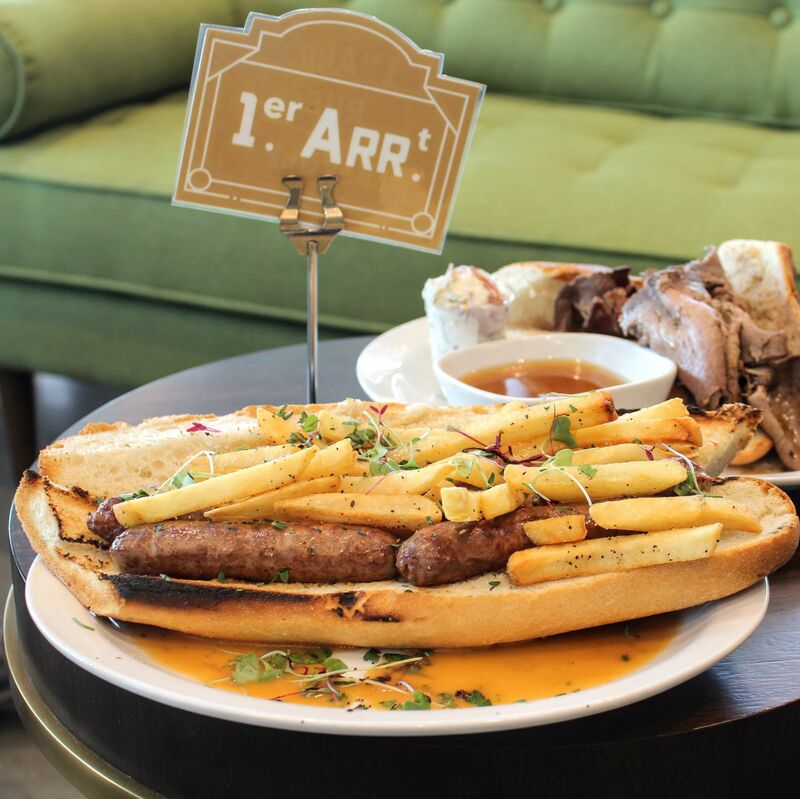 If you’re budget-hunting, the “merguez-frites” sandwich ($10) is immense, with a long hunk of crusty bread stuffed with four North African sausages and a cavalcade of French fries, drizzled with a gooey sauce and dotted with a handful of sprouts. 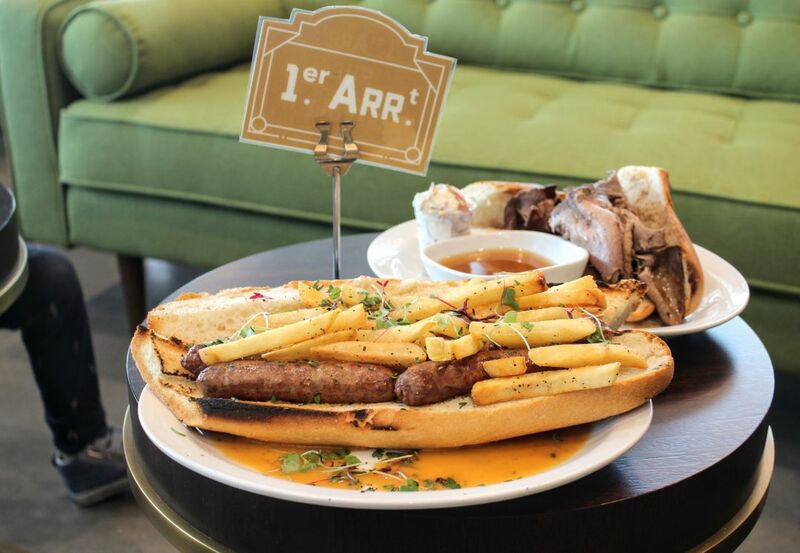 The prime rib sandwich ($10), contains just a baguette and some meat, with a small bowl of au jus to juice things up. Both are tasty, but the surprising star of one recent late-afternoon meal was the brasserie’s simple avocado salad ($10). Served with an assertive, acid-forward dressing, it’s a sassy slap to your taste buds. And one more tip: Don’t miss the nitro cold brew at the nearby coffee counter. It’ll make dealing with the stress of checkout all that much easier. Brasserie Honoré is located inside the Whole Foods Market at 5298 University Parkway, Sarasota, and is open 8 a.m.-10 p.m. daily. For more info, call (941) 806-6130 or visit the store's website.